First organic shampoo product I’ve ever used and I’m hooked! Absolutely love it. After 3 washes it’s removed all my product build up from drug store shampoos. My hair used to be sticky and clump together and leave product build up in my brushes. This shampoo leaves my hair squeaky clean without stripping the natural oils. Also, love the unbeatable prices with the monthly subscription. After suffering with a dry/itchy scalp for years, my scalp feels so healthy and moisturized! I no longer have the consistent urge to itch and my hair smells AMAZING! With a dry scalp and long, thick, curly hair that is prone to frizz it difficult finding conventional hair products that work for me but I am so glad this was the first vegan, all natural product I have tried because it is amazing. It lathers well and cleans a weeks worth of grime and greasiness. I would also recommend the healthy scalp super conditioner to compliment this product. There is nothing better than Truly Organic, smells great, affordable, and works! I am a lifetime fan, tried many other products but I am never switching again...!!! 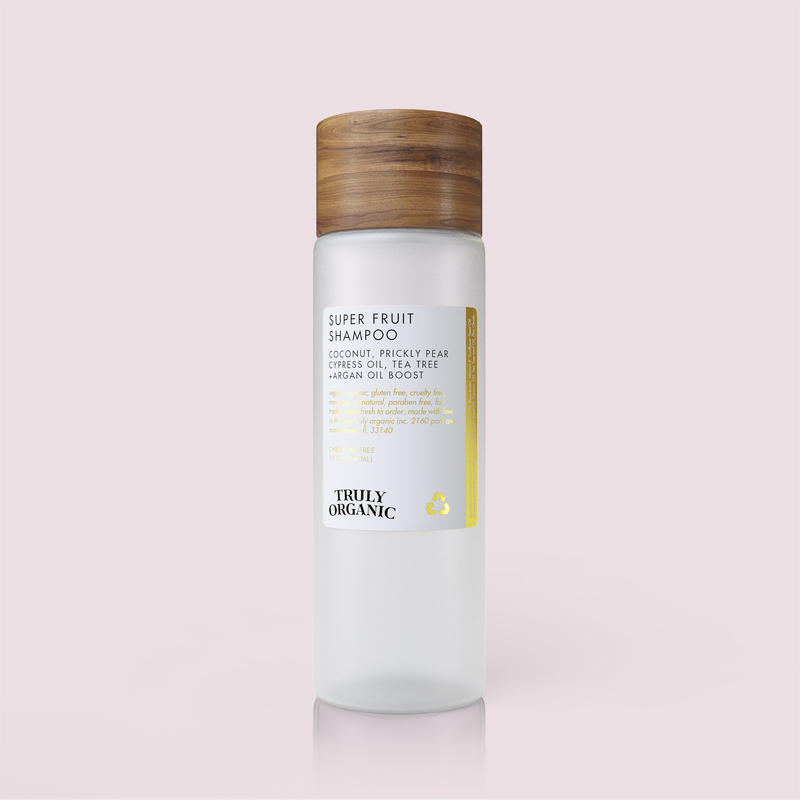 First time user had been looking for an organic product at a reasonable price and the Truly Organic bundle is both a great product and well priced. Love the body wash would have to be one of the best I have ever used. I have very sensitive skin and have had multiple problems with all kinds of lotions etc in the past. I'm able to use the Truly Organic products even on my facial skin with no problems. I use the lotion, the face cream and serum and love them all especially the Coconut. Just wish they were carried in more stores. I've tried several types of organic lotions, this Truly Organic one smells the best. Good consistency, non-greasy. Smells very lightly like real coconut - suggesting to me that they use good coconut oil. I recommend this, it has become my go-to body lotion. Truly Organic has excellent products. send to daughter in NYC who has the beauty industry at her fingertips but prefers to support sustainable cruelty free brands. My husband, daughyer and I all use. The product arrived looking exactly like the picture. Very thick consistency, with a nutmeg all spicy smell. Will keep this away from light since the bottle is see thru. A little bit goes a long way for soft, clear skin. This product arrived in a dark brown bottle with a black dropper. Not even close to looking like the picture. It is also very small. It has a musky sweet smell kind of like a moldy candy. Not the most amazing smell, but it's something that goes away. The oil blend is very light and easily absorbed. Leaves a soft and bright skin, not greasy. I used it over my foundation and blended it into my skin with a beauty blender. I can't get over how glowy it made my skin! This is a must have for me now! I would recommend 1/2 a tablespoon of the powder to 1/4 tablespoon water, that was the perfect amount for one use for me. It is cooling and you can feel it tightening as it drys. It was a touch itchy for the last five minutes but OMG the pay of is amazingly soft skin. I used the super facial cleanser before this product. Leaves my skin feeling refreshed, smooth, and wonderful. Leaves my mind at ease knowing it is all natural, chemical free, and made fresh. Bonus: it lathers well and smells great. Leaves my curls springy, reduced frizz, and smells great. Definitely going to be my long term conditioner. Smooth as a baby's bottom! After using my black soap scrub bar, my face was smooth and clean, and didn't really need anything heavy. I put this on and it was like turning my face into silk! It was so light weight and absorbed right into my skin. This morning my skin still looked beautiful! So happy with my first try! I used my Black Soap Scrub Bar for the first time last night, and while I was expecting a little more exfoliation (maybe the scrubbies will come out more next use), my skin felt so clean and soft after! Not to mention the scent is heavenly <3! I'm obsessed and can't wait to wash my face again today! Esta crema es super hidratante y el olor es maravilloso. La uso en las mañanas y Deeply Moisturizing Super Body Lotion de noche. Mi piel se siente suave y tersa. Me encanta como mi piel se siente! This cream is super moisturizing and the smell is wonderful. I use it in the mornings, and Deeply Moisturizing Super Body Night Lotion at night. My skin feels soft and smooth. I love how my skin feels! Used before applying my moisturizers, it feels great! One of the best conditioners I have ever tried. It is easy to apply and wash out and leaves my hair incredibly smooth and smelling fresh. It is also easy to use thanks to the dispenser. Finally found a great facial cleanser that doesn't dry out senstive, very sensitve, skin! Don't even have to use lotion :) very happy with this product. Has also helped clear up the little acne I had. Love the clear bottle. The shampoo cleanses the hair with great lather and very little scent. I pre poo with several oil blends and this shampoo washes the hair clean. I would love to see this come with a pump, as the shampoo is very thick. Great product, will definitely repurchase. This eye cream is the best! Nice and thick, but absorbs quickly. I apply over entire eyelid and under eye , and it hydrates, refreshes, and deputy's. Love the jar packaging. You can scoop out every last bit. Truly organic is the best brand I ever try. I've voluminous and curly hair. It was so dry. But since I use this product, my hair (on the scalp) is so mush softer. It's a little bit expensive (I'm french, so the shipping are bigger) but I've find my hair routine. My face feels soooo clean after washing it with this soap! and it smells amazing!!!!!! It foams and smells spectacular!! you only need a few drops to wash your whole body. Truly love it! Best organic hair care out there, and trust me I have tried them all! Definitely try Truly Organic...They even offer single products now as well just for a little more money than the bundle price. Using it from long time.